In May, the AGRICURB team returned to the north of Morocco to continue weed survey and isotope sampling of modern crop fields. 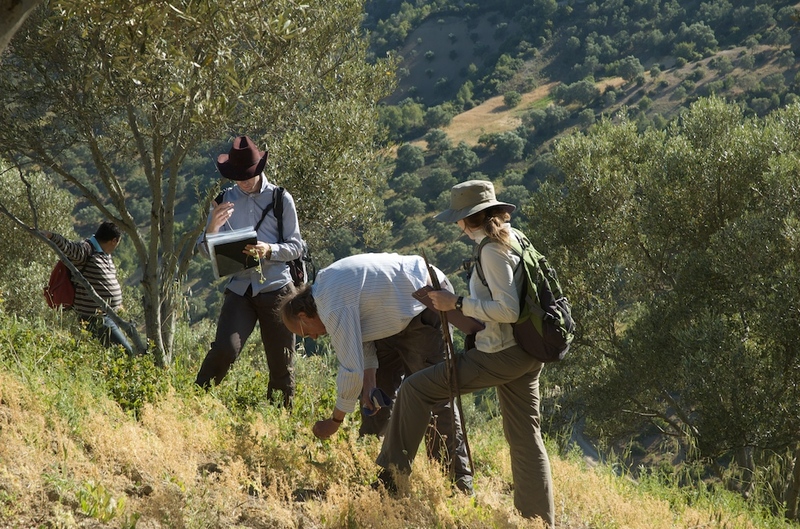 We were based at Bellota, an agroecology centre 30km from Chefchaouen in the Rif region of Morocco. The centre promotes a sustainable and holistic approach to agriculture, offering training courses to local farmers to help them improve the fertility of their soil, without the use of chemical fertilisers. The trip proved to be particularly interesting because of the prevalence of extensively managed pulse fields – broad bean, bitter vetch, lentil and chickpea. This is the first time that we have carried out weed surveys and isotope sampling on such extensively managed pulse fields (up to 1 hectare in area), which will provide a contrast to the results of previous studies on intensively cultivated garden plots in Evvia, Greece and Asturias, Spain. For more information about the work at Bellota, here is a video of Salaheddin El Azzouzi describing the project (in French). A very steep lentil field!